PNG stands for Portable Graphics Format. This format was developed to replace Graphics Interchange Format or GIF. PNG files have the ability to display transparent backgrounds. The main purpose of developing this tool was to transfer the images on the internet. It has become a popular format as you can use a lot of editing effects. What if you want to share a PNG image in the form of a file? This can be done if you convert the PNG item to PDF format. To do this with ease, you can use PNG to PDF Converter. 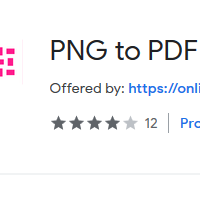 This tool has amazing capabilities to convert PNG items to PDF with great speed and quality. You will be impressed by this simple yet powerful app. So download PNG to PDF Converter and convert any PNG item to PDF now! This tool has been designed for your convenience. Converting a file with this tool is an effortless task. Once you get easy access to your PNG items in your system, you can drag those file and drop into the PNG to PDF Converter. PNG to PDF Converter let you arrange your PDF file as per your need. You can arrange page order, move the items up, down and can delete the selected pages or items. This tool will enable you to select the destination directory for the converted files. Once you select the output folder, this will be open at the end of the conversion process. Converting every file one-by-one is a waste of time. To save you from this hazard, PNG to PDF Converter allows you to convert many PNG items to PDF format at once. You can also convert all PNG files to a single PDF file. Feel comfortable when converting PNG files with PNG to PDF Converter now!